Homelessness in it’s most basic form. You are welcome to read my blog and pass on any info. T.J. Typically when people think of homelessness they think of older men or women living in dirty clothes and living under bridges. In reality homelessness is a lot more common than a lot of people think. In Australia there are over 105,000 (about 0.5% of our population) people who are considered homeless. I could never understand why no one can buy a cup of coffee with food stamps… that comes under hot food (yada, yada, yada). A speciality coffee shop which prides itself on doing things differently is showing compassion for Fitzrovia’s rough sleepers by asking its customers to donate a coffee so that a homeless person can come in and enjoy a free cup. 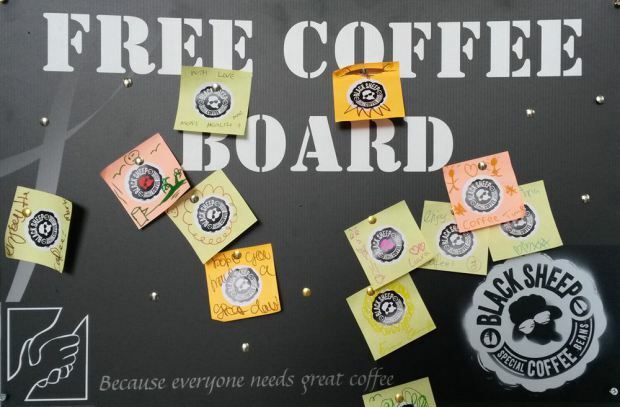 At Black Sheep Coffee, 63 Charlotte Street., customers are invited to donate a coffee so that a homeless person can enjoy a cup for free. 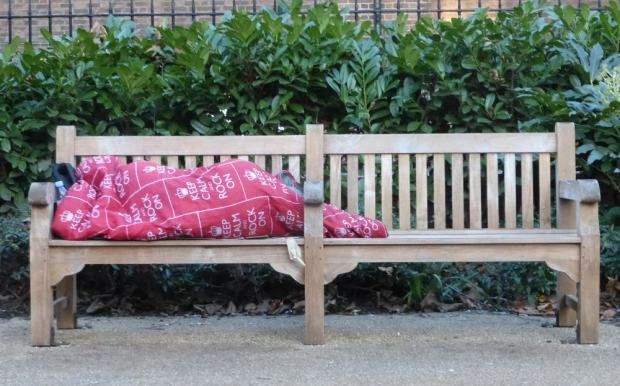 The initiative which started this spring is in stark contrast to the Fitzrovia Business Improvement District which has been discouraging its members from engaging with Fitzrovia’s rough sleeping community. 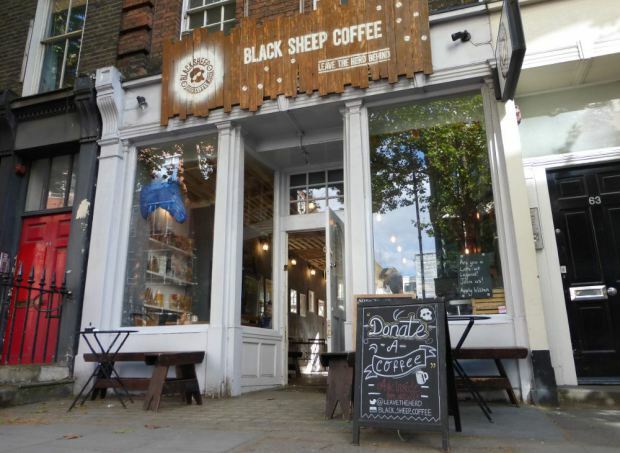 Gabriel Shohet, one of the co-founders at Black Sheep Coffee and responsible for the Free Coffee Initiative, told Fitzrovia News that everyday they see homeless people in the area and would like them to come into the shop and “get a coffee just like anyone else”. Do more than help your fellow man, make him equal to you. If you are helping the homeless, that is great. If you are voicing support for equality, that is great also… there is the long-term fix to the problems of poverty. In the west, you are expected to have skills and ambition that evolves at the speed of the technology… and if you “fail” by not having all the modern conveniences, achieving a six figure income, or at least pretending to do those things by living on credit, well no sympathy for you! Meanwhile, we forget that all the blue collar jobs have left this hemisphere. T.J.
[ooyala code=”9tMzRhdTqcGRRbEMgmKWRM-2UQSrTmc6″ player_id=”55ce3a06495346ddb20768902d1e991c”]Virginia Beach, Va. – A man was seen by employees of a Virginia Beach restaurant digging through a trash can looking for something to eat and the business took action. Eleni Fotidou is the owner of Zorba’s, a Greek restaurant on Princess Anne Road in Virginia Beach. “I never want to see anyone like that,” says Fotidou. Last Friday, she and others were disturbed. “We didn’t quite realize what he was doing at first, but to take a better look at it at him, you realize he’s searching for food,” says Samantha McCauley. The owners say they were heartbroken when they looked outside and saw the man looking for food in the trash. “No one is allowed in 2015 to go to bed starving,” says Fotidou. The owners showed us their security video from last Friday. They said minutes after the man was searching through the trash, you can see him walking away. Most people do not choose to be homeless, but many don’t like living in the dog-eat-dog world that has been created by modern society. 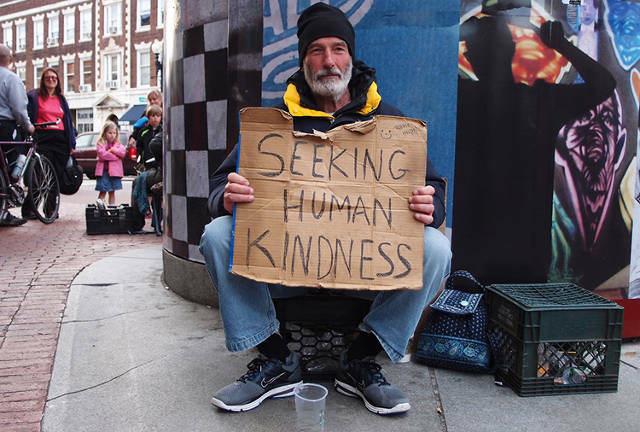 T.J.
“When one has consorted with them, and found that they are ordinary human beings, one cannot help being struck by the curious attitude that society takes towards them,” wrote George Orwell about the homeless in his 1933 memoir, Down and Out in Paris and London. What would Orwell, who championed clarity and transparency in writing, have made of Camden Cllr Jonathan Simpson’s comments, as reported in a recent Fitzrovia News article (“Counting Rough Sleepers…”, 13 April), when he included rough sleepers as among those who have a “street based lifestyle”? Who’s the expert on your life? On March 22nd my home flooded. Suddenly I lost my safe haven and my life became a ball of chaos and stress. It was hard for me to focus at work, I was constantly on the phone with the insurance company, I forgot to pay my credit card bill twice, and I broke down crying about a dozen times. This was my experience despite having a loving partner by my side, a flexible job, and friends and family to offer their support. Which made me think about how much harder it is for those who don’t have support or resources. Yesterday, our country celebrated one of 10 federal holidays- Memorial Day. This holiday was known as Decoration Day, for the practice of decorating graves of fallen soldiers with flowers, wreaths and flags. On many occasions, Veterans are celebrated, honored and loved by most family members and friends. We want to be able to show that same support to the men and women who have fought for our country and now are living among the homeless. So what can you do to help a homeless person who says they are a veteran? Conducting coordinated outreach to proactively seek out Veterans in need of assistance. ” Until now, single homeless people had to prove that they were particularly vulnerable compared to other homeless people in order to qualify for support. This has now changed. They no longer have to show that they are more likely to come to harm (commit suicide, resort to drug use, etc.) than “an ordinary homeless person”. This is really the way they think in social services, I kid you not. Oh, the drama I had to stir up just to get my apartment after 4 years of being homeless. The housing department said I “didn’t look homeless”! T.J. Earlier today (13 May) the Supreme Court gave a ruling on a case about the way local councils decide who is ‘vulnerable enough’ for housing help. The judgement is quite sensational. Until now, single homeless people had to prove that they were particularly vulnerable compared to other homeless people in order to qualify for support. This has now changed. They no longer have to show that they are more likely to come to harm (commit suicide, resort to drug use, etc.) than “an ordinary homeless person”. That led to situations where single homeless people suffering from problems including depression and suicidal thoughts were deemed not vulnerable because “an ordinary homeless person” would also be expected to suffer from those problems. (I kid you not!). How Did We Become OK With Homelessness? You don’t have to do anything to stop homelessness… too big a task. Just don’t do something to discourage those who want to get off the streets. Don’t refuse to help when it is in your power to do so (esp. when you are being paid to help). Hear that caseworkers? But I learned by example to just keep moving my feet. Dallas Is Building Cottages For The Homeless, And Saving $1.3 Million In The Process! Who’s worse, homeless people or drug dealers?